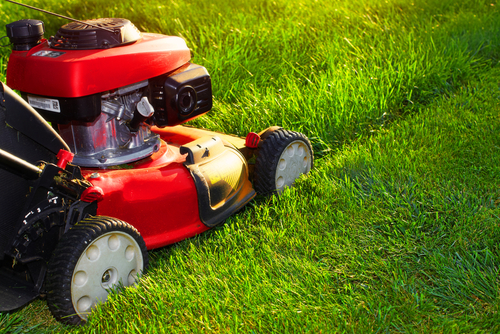 You may be wondering how often you should mow the lawn to keep your yard looking its best. The most important factor that influences lawn mowing frequency is how fast your lawn grows. Knowing the one-third rule (cutting off no more than the top one-third of the grass stalks) is also important when you set your lawn mower height and mow the lawn. Taking off a larger portion of the grass height than that will stress out your turf. These factors also affect mowing frequency. If you are mowing your lawn when it gets to two inches in height, then do not let it grow past three inches before you mow again. That is an example of the one-third rule. This is why there is no hard-and-fast timeline for how often you should mow the lawn. If weather and other factors are making your grasses grow quickly, then you will have to mow it more often than if it is a slower growing season. Sometimes situations arise where you cannot mow your lawn and it grows past the mark where you can apply that one-third rule. Do not cut it down to two inches right away. You should gradually cut the grass down to the proper height over several mowings. Taking it all down at once may shock the grass and cause an unhealthy buildup of grass clippings. A healthy and vibrant lawn can be achieved through studying your turf and applying the right techniques at the right time.